Keeping your marriage healthy is paramount for your mental, physical, even financial health. This article was first published January 15, 2018, at Christian Post. A chat with one of the authors. This article was first posted at Mercatornet on December 5. 2016. 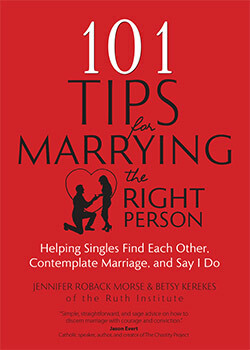 Betsy Kerekes is Director of Online Publications at the Ruth Institute and co-author with Dr Jennifer Roback Morse of a new book: 101 Tips for Marrying the Right Person: Helping Singles Find Each Other, Contemplate Marriage, and Say I Do (find a few of those tips here). With so much out there on marriage and relationships, I asked her a few questions about the book and how it is different to other material. What made you and Jennifer think there was a need for this book? Are there any other books like this out there and if so, what makes this one different from the rest? Too many people get divorced. That's clear enough. We hope that with this book we can help people take the preventative measure of giving this decision the seriousness and discernment it requires. We've seen far too often the heartache of family breakdown and the devastating effect divorce has on kids. If we can do something to help end that vicious cycle, we'll do it. Our first book, 101 Tips for a Happier Marriage, has that goal as well. This book is like the prequel to that book. Undoubtedly there are books out there along the same lines as ours. What makes ours different is how compact it is. We don't mince words. We tell it like it is as quickly and concisely as possible. We've been told this is a great strategy for male readers, which wasn't our aim, but is a happy side-effect. Also, our book is undoubtedly Catholic. Without being preachy, we convey the tenets of the faith, not because we think this book will only help Catholics, but because the long-standing teachings of our faith have proven correct. People are happier when they do things the right way, in the right order. A lot of heartache can be prevented by people following the guidelines of the Catholic faith. Along those lines, we delve extensively into the harms of cohabitation - a misstep that affects otherwise faithful Catholics because it's become so commonplace. Commonplace does not equal a good idea. In this case, quite the opposite actually, and we give evidence from secular studies to back up what the Church already says in this regard. 101 tips sounds an awful lot - is marriage that complicated these days? Maybe not that complicated, but that important. We start at the level of a single person, with tips on where to look and how to get yourself into a marriage-ready position. Then we discuss questions to ask if you're dating someone and are thinking he or she might be The One. When things get more serious, we lay out the major areas where agreement and compatibility are crucial. We have tips running the full gamut of readers: single, dating, formerly married, older seeker, etc. We made sure there's something in here for everyone. How do singles keep a balance between being too picky and not being picky enough when it comes to dating? The simplest answer is, there are tips for that. A large portion of the book helps individuals answer these questions. In some cases, you should be picky. In other areas, you need to relax your aim. There's no real easy answer for this, but our tips help readers know how to walk that fine line. Do you believe there is one right person for everyone? I believe that God has a plan. If he wants you to get married, there's a person he has picked out for you. Finding that person requires prayer and careful discernment. It is possible to fall in love with the wrong person and miss the right person in the meantime. That's why prayerful openness and patience for following God's will are crucial. If your spouse dies and God intends for you to remarry, lo and behold, you will discover another right person for you. He doesn't intend for you to do something and then make it impossible to carry it out. It's not about soulmates, it's about God's plan for getting you to Heaven. 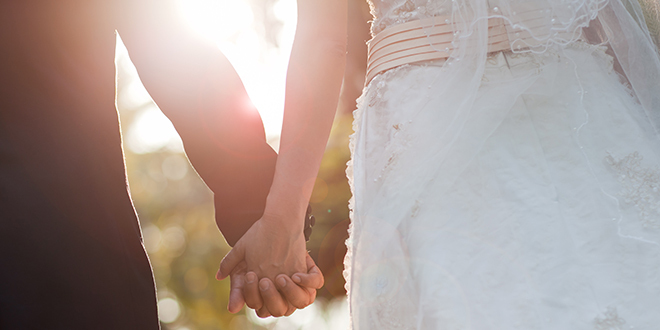 Marrying the right person ensures your vocation is on the right track. And your vocation, regardless of what it may be, is designed to get you to Heaven. If your vocation is marriage, this person will help you on your path to Heaven, and vice versa. Since God is infinitely wiser than we, not asking for his guidance is folly. How did you compile your tips? From your own experience or perhaps that of friends and family? Both. I remembered a lot of stories from others that helped contribute to my portions of the book, as well as a few from my own experience. My co-author, Dr. Jennifer Roback Morse, is more into the research aspect of things, so the "heavier" tips near the end of the book are mostly from her vast scientific knowledge of all-things marriage. If a reader could come away from this book with one tip in mind, which would you want it to be? Pray. Life is hard. Trying to go it alone adds undue stress. Maybe prayer doesn't magically make your life easier, after all, no one gets to Heaven without some measure of suffering, but it gives clarity and consolation. Know that God wants you to be happy, and if being married is his plan for your happiness, it will happen. Just be open and pay attention to him. My mantra for years and in all matters has been: patience and trust. I invite frustrated singles to use it as well. You can also read a Fathers for Good interview with Jennifer Roback Morse on her previous book on a happier marriage. Go out and get this book, “101 Tips for a Happier Marriage”, written by Jennifer Roback Morse and Betsy Kerekes. It is full of sage advice that would have been obvious to previous generations but, like the art of home cooking, seems to have fallen by the wayside in modern society. In celebration of National Marriage Week, Ave Maria Press is featuring a short series of stories with important pieces of marriage advice. For more information about this celebration of National Marriage Week visit, www.avemariapress.com/marriageweek. While they probably won’t admit it, every married person holds on to some little things that annoy them about their spouse. It may be the way the other person brushes their teeth, or makes the bed, or chews their food. Or maybe it is the annoying habit that they just can’t shake. It is always something minor, yet irritating, that can turn into something very annoying. Betsy Kerekes, author of 101 Tips for a Happier Marriage, learned a valuable lesson when it came to these little annoyances. Betsy’s husband loves their kids. He wants them to be safe and make good choices. Like any parent, he tries to stop the kids when they are doing something wrong. When he would see them doing something wrong, though, he would say “Stop! Stop! Stop!” three times. Always three times. He did this repeatedly. Now, this confrontation might have led to a fight for a lot of couples. He could have gotten defensive, even angry. “I love his ability to keep things light-hearted,” Betsy said. It didn’t take long for Betsy to realize that her husband was really having a hard time breaking his triple (or even quadruple) stop admonition. Instead of getting annoyed, she realized she should just let it go. He clearly couldn’t help it and what was the big deal, anyway? Now, whenever that triple “stop” comes out again, she is reminded of their little joke. She smiles rather than getting annoyed because she’s able to keep a sense of humor about the situation. There’s no reason to turn it into a conflict because now they have a little inside joke to make each other smile.